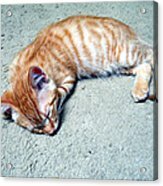 Ginger Sleeps by Eric Forster - 8.000" x 6.000"
Ginger Sleeps framed print by Eric Forster. Bring your print to life with hundreds of different frame and mat combinations. Our framed prints are assembled, packaged, and shipped by our expert framing staff and delivered "ready to hang" with pre-attached hanging wire, mounting hooks, and nails. Yes, and he will be the first tell you just how adorable. 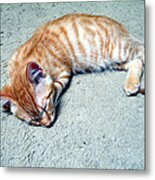 There is nothing as peaceful as a sleeping cat. He is looking beautiful. This is one of the rare moments he's not on the move. Thank you, Kandy. She's a he. I thought I was told it was girl cat, and named him before he moved in. Yes, he photographs well. My late Santana had a very similar tail. 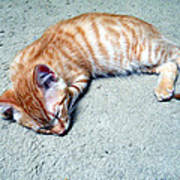 Young Ginger decides that the living room carpet is a good place for a nap. Eric's mother inspired his interest in art. She was an accomplished watercolorist, who also designed and screen printed her own Christmas cards. Eric would often help his mother with her screen printing. Eric's interest in photography comes from his father, an engineer who was a great amateur photographer. In school, Eric chose art as one of his electives, and studied architecture in college. He has worked as a photographer, videographer, and graphic designer. To purchase original art, please also visit Eric Forster Saatchi Art https://www.saatchiart.com/ericforster. Eric can also be found on Facebook at Eric Forster Fine Art.